The rise in obesity has become a major health issue in the United States. (ages 20-74) are defined by a BMI of ≥ 30. 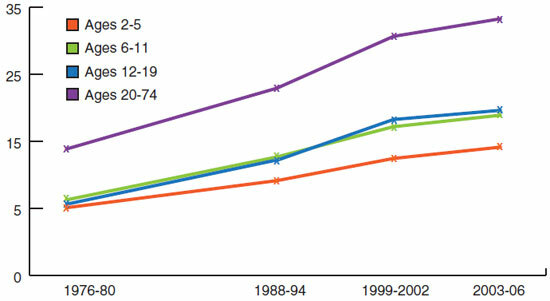 Between 1990 and 2007, the prevalence of obesity among Vermont adults has doubled. 12.9% of children aged 10-17 were obese and another 13.8% were overweight. 21.7% of adult females were obese and another 25.3% were overweight. Over the last 30 years, sugar sweetened beverage (SSBs) consumption has increased dramatically, particularly among children. The average person drinks 45 gallons of SSBs each year. Soda is now the third largest source of calories for children ages 2-18. For children, each extra can or glass of SSB consumed per day increases their chance of becoming obese by 60%. People who drink 1-2 servings a day of SSBs are 26% more likely to develop type 2 diabetes than people who drink 0-1 serving a month. Regular consumption of SSBs is associated with a higher risk of cardiovascular heart disease in women, even after other unhealthful lifestyle or dietary factors are accounted for. Overweight and obesity contribute to 14 to 20 percent of all cancer deaths and have been associated with increased risk for several common cancers including colon, esophagus, kidney, endometrial and breast cancer in postmenopausal women. Children who consume more soft drinks, relative to milk and 100% fruit juice, have a greater risk of developing dental caries as they grew older. According to a study published by the University of Vermont’s James Jeffords Vermont Legislative Research Service, in 2010 the cost of obesity for the State of Vermont, its employers, and private citizens was estimated to be $615.2 million. This includes half of all Medicare and Medicaid expenses ($163 million) which are attributable to obesity.